The boy on the right of the picture wearing a jacket with arms folded is John Gaynor, son of Len Gaynor, a Retained Fireman of 35 Stoney Street. The man immediately to the right of Santa is Fireman Ted Bullard and the man on the far left (back to window) is Fireman Chadney of Stoney Street. Fireman Bullard has been positively identified by Susan Wheat (née Stevenson) who appears on the photograph, standing on the left front row. Her father, Alf Stevenson was a Retained Fireman and Frances, her mothor, also served as a Firewoman during the War, based at Elm House, now incorporated into the row of shops next to the main entrance to Broadgate Park. 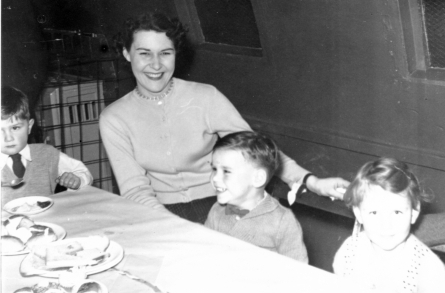 She tells us that Frank Grey and Bill Tew are also in the photograph. She believes that some firemen may be missing as they were in the panto that they put on for the kids. One tale was that they were called to a fire and turned up in full costume! 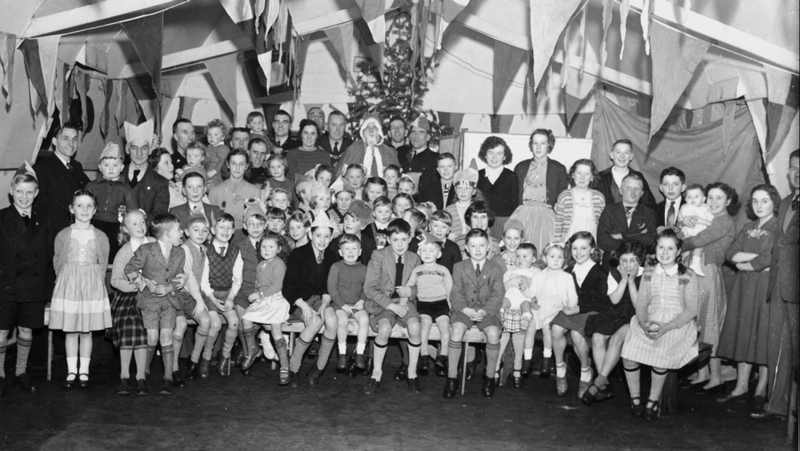 These annual events in that era were hosted by the men of the Beeston Fire Station and held in the Tarren Hut which was part of the Fire Station complex at the top of Stoney Street, Beeston. The photographs are amongst several photographs with associated memories shared by Roger Brailsford who, as a child, lived at one of the Fire Service houses at the top of Stoney Street where his father, Bill Brailsford, served as a firemen. 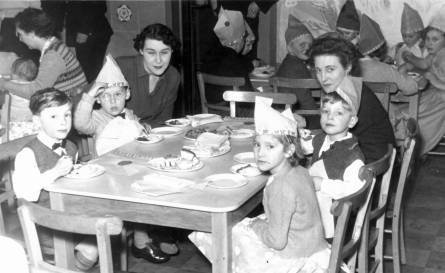 Roger, who now lives in Australia, appears with his mother Joan Brailsford in each of the smaller pictures - in the 1954 photo he is towards the left with the paper hat and, in 1955, he is in the centre of the photograph. Roger tells us that the Tarren Hut was similar to a Nissen Hut with a rounded body, but was lined inside and had external frosted (possibly wire reinforced) glass windows .The exterior had tar paper over a flexible timber (ply?) sheet covering. As Nissen Huts were constructed in multiples of 6ft, this one was probably 24' or 30' long. He recalls that, by 1957, the firemen had built a bar at the far end of the Tarren Hut called the "Blue Marlin" complete with an illuminated blue marlin motif above the bar. None of the other individuals shown are identified currently. Let us know if you recognise any of them.